The easy-to-use SircleBind CombBind CB240e is the most affordable high quality electric punch comb binder offered on the marketplace today. The SircleBind CB-240e is an electric punch and manual bind plastic comb binding machine, it has built-in margin and punch depth guides as well as an adjustable edge guide for proper paper alignment. The foot pedal punching activation leaves both hands free for preparing your next book to be bound. The CB-240e weighs 51.5 pounds and it measures about 19.25″ x 20″ x 6.75″, so it will fit on almost any table or desk space. The 21 selectable die pins can be enabled or disengaged for various sized binding edges, this feature is especially important if you are punching sheet sizes other than 11”. The punch depth control lets you choose from three depths for hole placement, and the handle can be disassembled for ease of punching larger documents. The CB-240e Comb Binding Machine features a built-in comb spreader for comb binders up to 2 inches in diameter. You can power through up to 25 pages at a time with this electric comb punch. 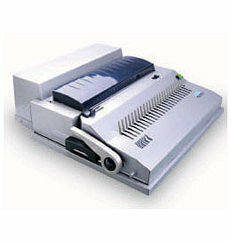 This SircleBind Binding Machine has a standard 2 year manufacturer’s warranty which is included. This affordable priced machine will meet the flexibility and durability that one seeks in a disengageable die comb binding machine. The SircleBind CB-240e comb binding machine is packed with all of the essential features that makes it the preferred choice for print shops, copy centers and schools. If you have any questions or are interested in purchasing the SircleBind CB-240e, visit us at SpiralBinding.com. We have great pricing on a full line of Binding Machines. Call us at 1-800-631-3572 for more information.